Shane ‘Shakey’ Byrne limited edition of 100 fine art prints. 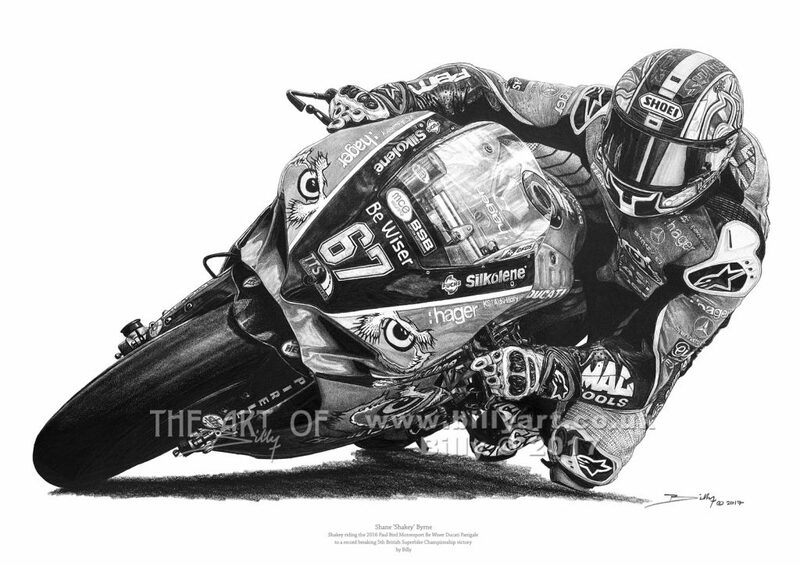 This brand new limited edition fine art print of Shakey taken from my pencil drawing shows Shane riding the 2016 Paul Bird Motorsport Be Wiser Ducati Panigale in the British Superbike Championship. Shakey made BSB history by winning the British Superbike Championship for a 5th time on the PBM Ducati. The print is available in A4, A3 and A2 and is embossed and signed with free UK post and packing. This entry was posted in Motorcycles, The Art of Billy Blog and tagged Art, Billy, Billy Art, billy the artist, BSB, Drawing, Ducati, Shakey, Shane Byrne on 09/02/2017 by billy.